Star Wars Jedi: Fallen Order revealed that it may be the Star Wars game we've all been waiting for over the weekend. Before Respawn Entertainment showed the promise of its own long-awaited, narrative-driven Star Wars title, there was another - one named Project Ragtag, aka the Visceral Star Wars project. Project Ragtag's director Amy Hennig told Eurogamer more about the canceled game in an interview that followed shortly after EA started hyping up Respawn's upcoming project. First off: though she wishes she could have shared her team's work on the game with the world, she doesn't sound bitter about that other narrative-driven, single-player Star Wars game charging ahead when EA semi-canceled hers for allegedly the same reasons. The industry's changing all the time, she said, "and I'm glad for Respawn's sake, because I'm excited about their game, and I've heard great things about it." 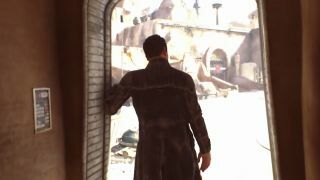 While Star Wars Jedi: Fallen Order will seemingly follow a single protagonist - Cal Kestis, a former padawan who survived the Empire's Jedi purge - Hennig said her team decided an ensemble approach would be its best way to tell a story that felt like Star Wars. This meant a change from her previous work on the Uncharted series, which almost always follows one protagonist. "We needed to cut away to the villains, for one thing, which was something I never allowed us to do on Uncharted. If you look at [the Indiana Jones series, Uncharted's primary inspiration], you don't really cut away from what Indy knows. There are a few exceptions but you're more or less with him the whole time. Star Wars, not only do we cut between villains but we also cut between multiple protagonists. So you still go OK, Luke is the hero of the story, but when you look at Han and Leia they're co-protagonists. And then you look at Rogue One, the animated show Rebels, those are ensemble stories. That's the Star Wars DNA, right? As far as single-player, third-person Star Wars action games go, it sounds like Hennig's project and Fallen Order could hardly have been more different. Though I'm eager to play through the story of a lone padawan on the run, I wish I lived in the galaxy where that ragtag gang of scoundrels made it out too. Read up on the Star Wars Jedi: Fallen Order story explained to see where your journeys could take you. Or get acquainted with the whole saga with our video guide to the Star Wars timeline.